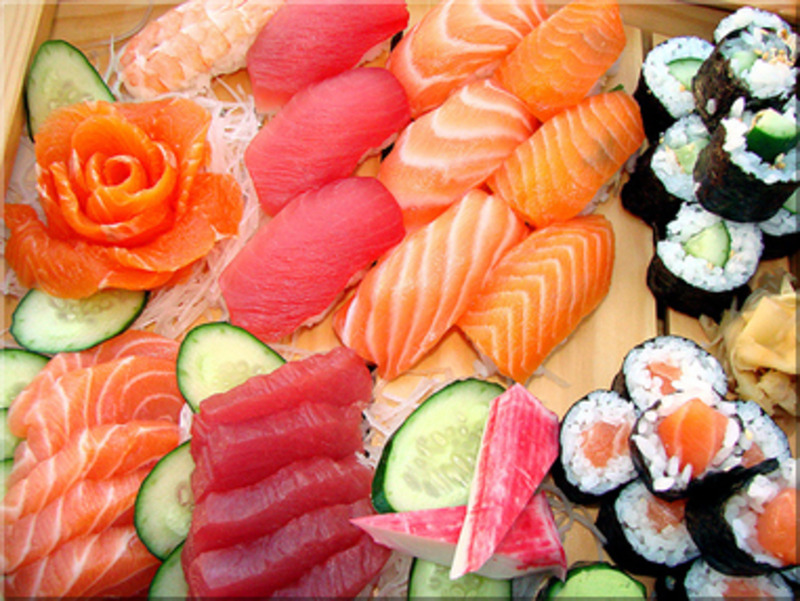 Sushi is becoming more and more popular all around the world. 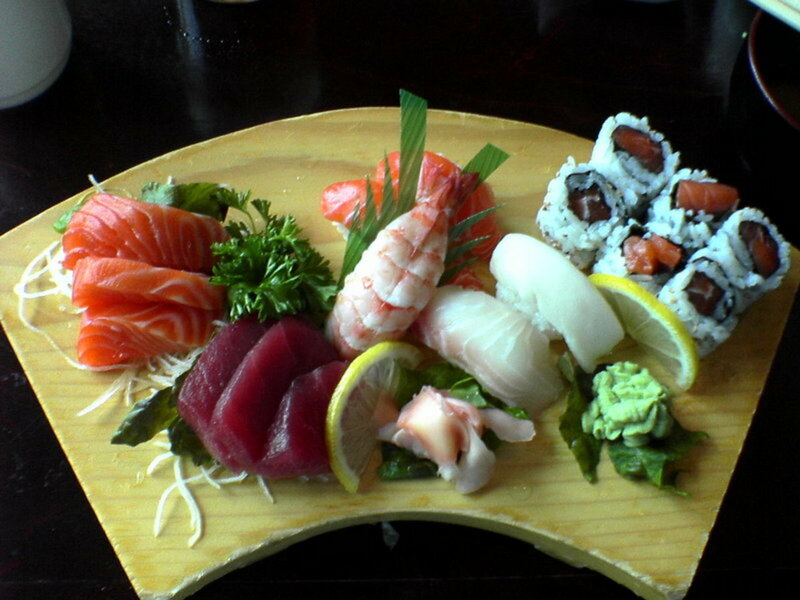 Eating out for sushi can be a great experience, but is often quite expensive. 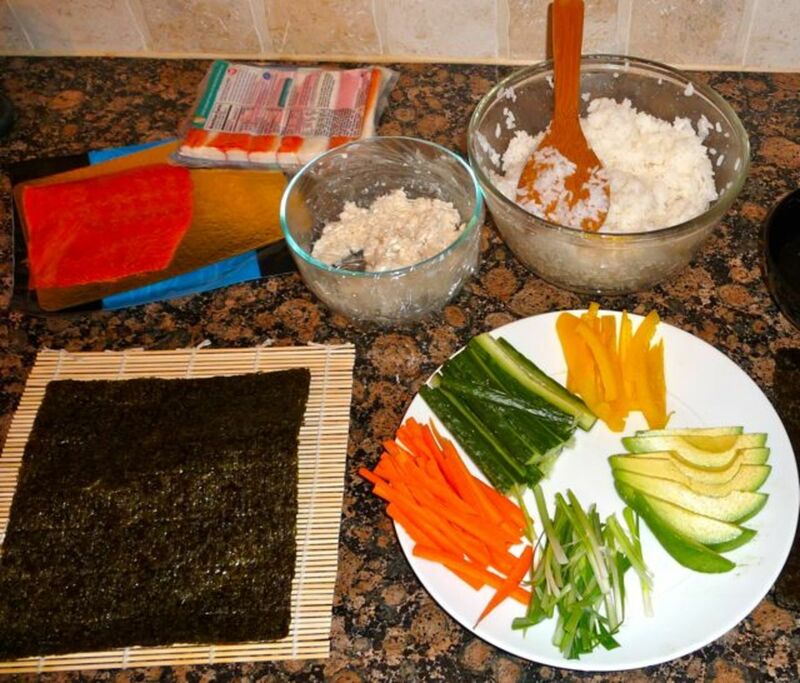 Making your own sushi is really fun and easy to do, and might save you some money as well. 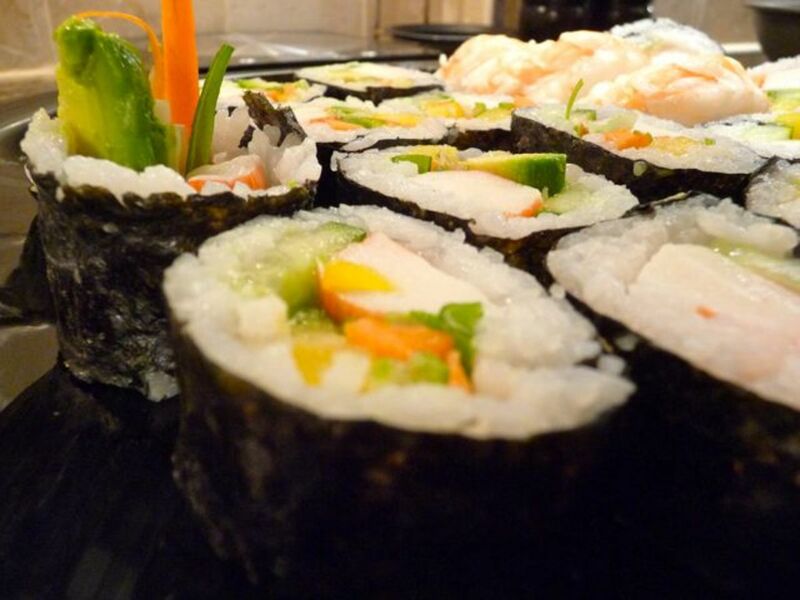 I will explain how to make 2 different types of sushi that will impress your friends and family - and possibly even convert some non-sushi lovers! The thought of making your own sushi can be intimidating. 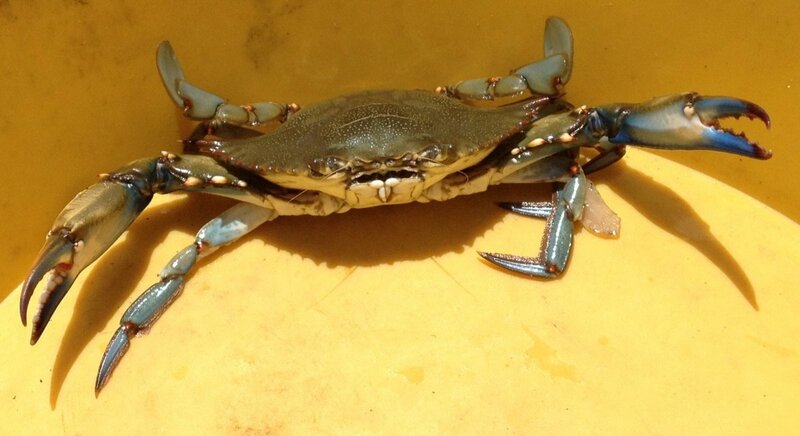 People are often scared about using raw fish. 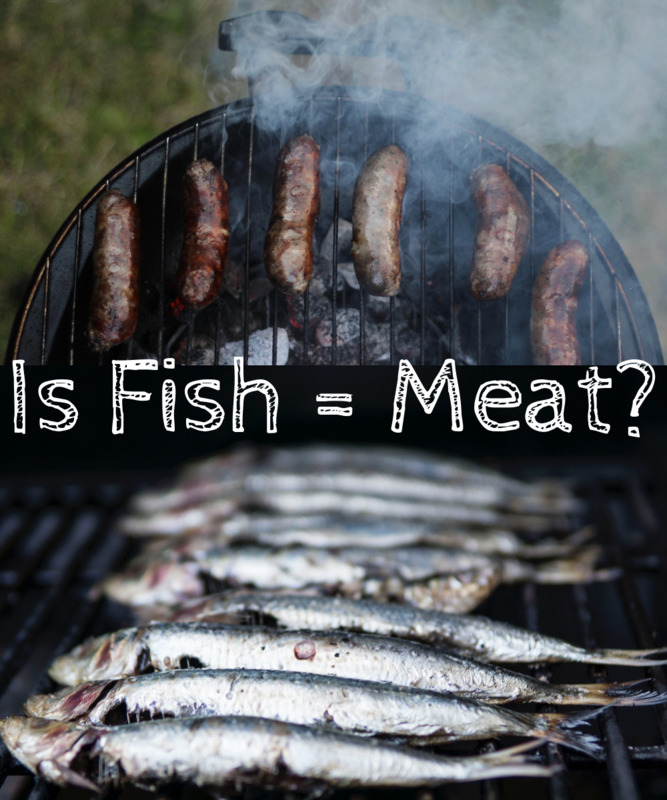 I have overcome this problem by not using any raw fish, and I will recommend you do the same unless you have a good source of sashimi grade fish. Sushi making is also perceived as too complex. With these simple recipes, a few basic tools and some fresh ingredients, you will soon be making sushi with ease. The rice is probably the most important part of the sushi experience. The key thing is to prepare your rice well in advance to allow cooling time. 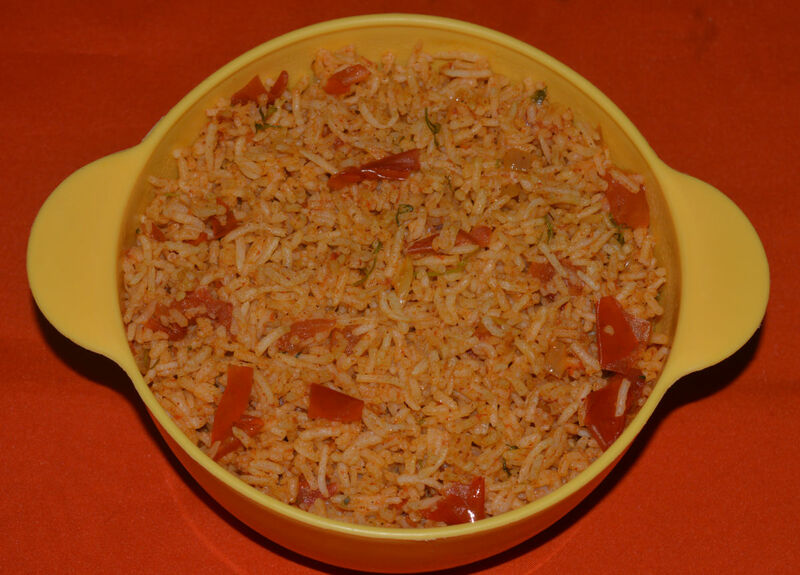 Rinse the rice off well with water to remove excess starch, and then drain well. Add the rice to the water, cover and bring to a boil. Reduce heat and simmer for 20 minutes. Transfer to a large bowl and let it stand for at least 10 minutes. Mix the rice vinegar, sugar and salt together. Pour the mixture over the rice to help it cool, then stir, making sure to coat every grain of rice. 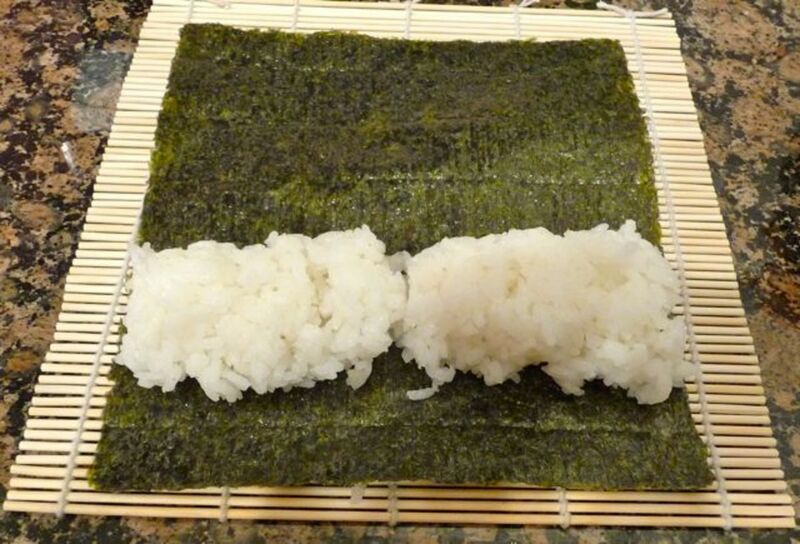 Make sure the rice cools completely before you start making your sushi. Prepare your filling. If your prawns are uncooked, then butterfly and cook them in a frying pan with a tiny splash of oil. If they are already cooked then cut them in half so they are nice and flat. Lay out several sheets of plastic wrap. Place your filling in the middle of each one. Wet your hands in a bowl of water, then take a walnut-sized handful of rice and shape it into a ball. Place it on top of your filling. 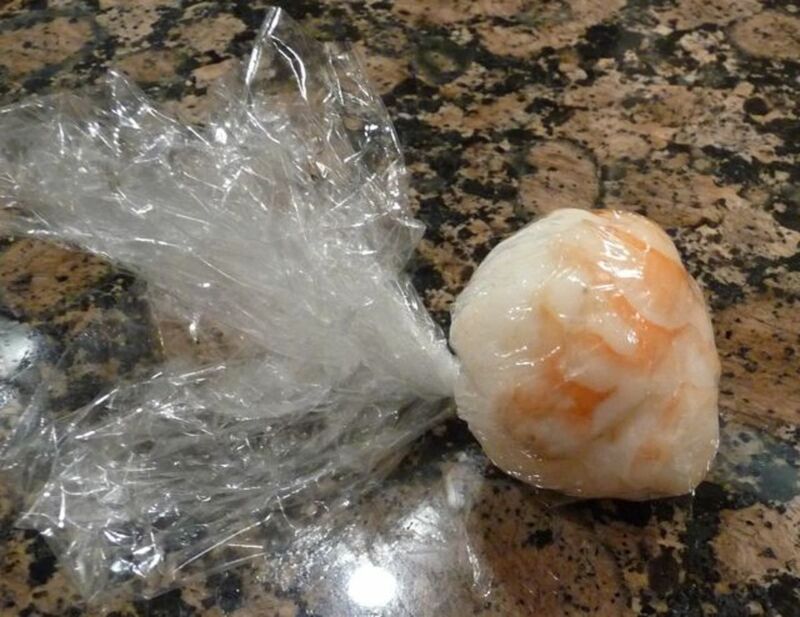 Wrap up the plastic wrap and then twist the end so that it compresses the rice and filling into a perfect little bite-sized ball. Remove the plastic wrap just before serving, and serve with little bowls of soy sauce for dipping and wasabi and pickled ginger on the side if desired. 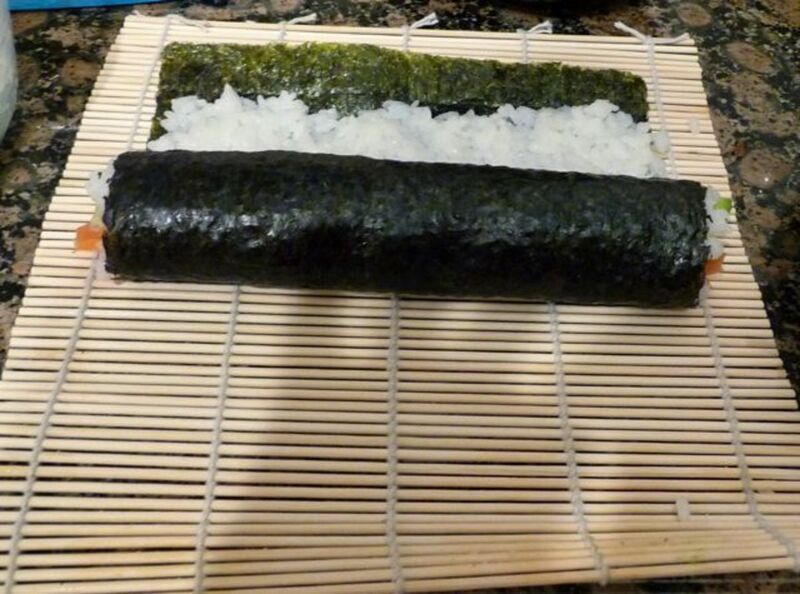 Bamboo rolling mat (makisu) - these mats are pretty cheap and make it much easier to make maki rolls without tearing the seaweed, but you could try using a placemat or some sheets of plastic wrap stuck together if you don't have one. Soy sauce, wasabi (Japanese horseradish), and pickled ginger, to serve (if desired). Get your ingredients prepped and ready to go before you start. Put 2 handfuls of sushi rice for each maki roll. Press down the rice evenly, making sure not to tear the nori. Leave a 1 inch gap with no rice at the top. Put your fillings 1-2 inches from the bottom of the sheet. Fold the bottom of the nori over the fillings firmly. Then roll it the rest of the way and seal by wetting the nori with water. Slice the roll into bite-sized pieces with a sharp knife. Prep your ingredients. Cut your veggies into long, thin pieces. If you are using canned tuna, mix it up with a bit of mayonnaise and maybe a tiny touch of wasabi, or however you like it. If you're using cooked prawns, you may need to halve them if they're large. Place 1 nori sheet shiny side down on your bamboo mat. 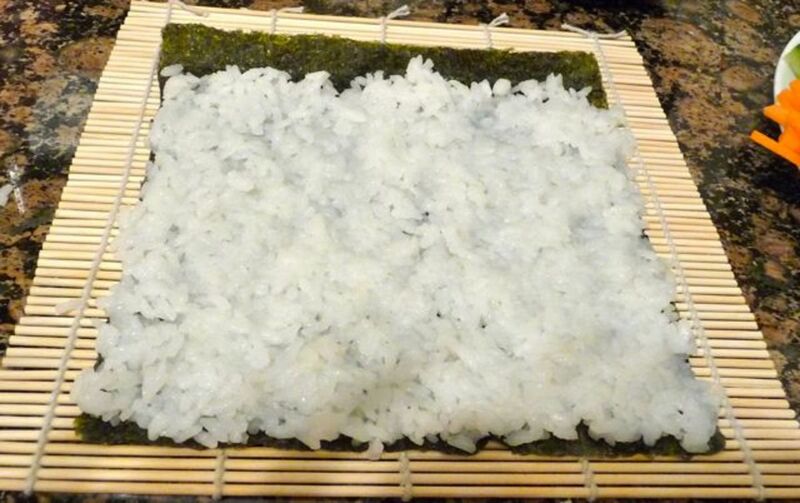 Wet your hands in a bowl of water, then grab 2 handfuls of sushi rice and place them on the nori. Keeping your hands wet, press down the rice thinly and evenly over the nori, leaving about a one inch gap with no rice on the top end. Place your ingredients on top of the rice 1-2 inches from the bottom of your mat (leave a bigger gap if you are adding a lot of fillings). Spread them evenly over the full width of your sheet. 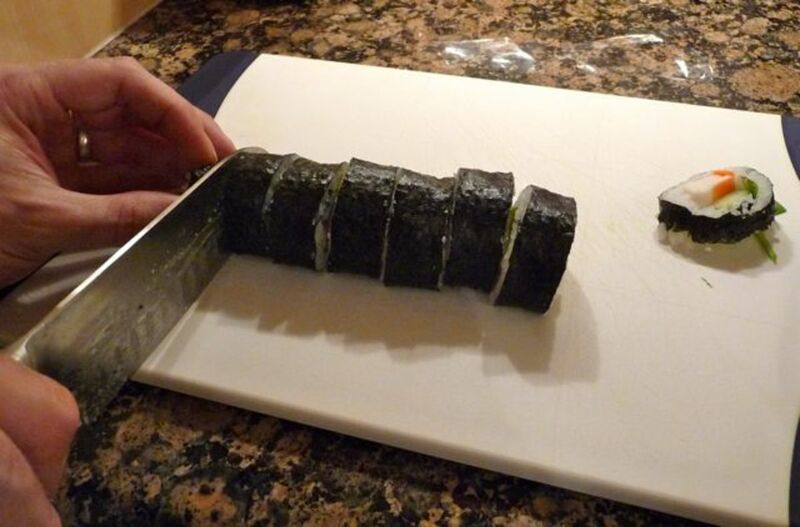 Keep in mind that you will later cut your roll into slices so make sure every bite will be as tasty as the next. Be careful not to overfill your roll (this will come with experience, so start off with less fillings and build your way up). 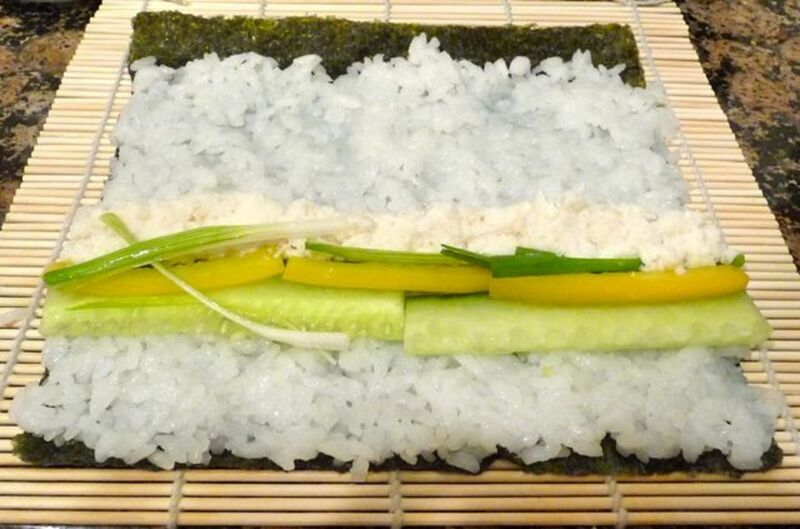 Using your mat, start rolling your sushi. Fold the bottom of the sheet over the top of the ingredients and press it down gently onto the rice. Now readjust your bamboo mat and finish rolling it up. Wet the top edge of the seaweed with a little water to stick it all together. To clean your bamboo mat when you're finished rolling, just soak it in a little water, but don't use soap. 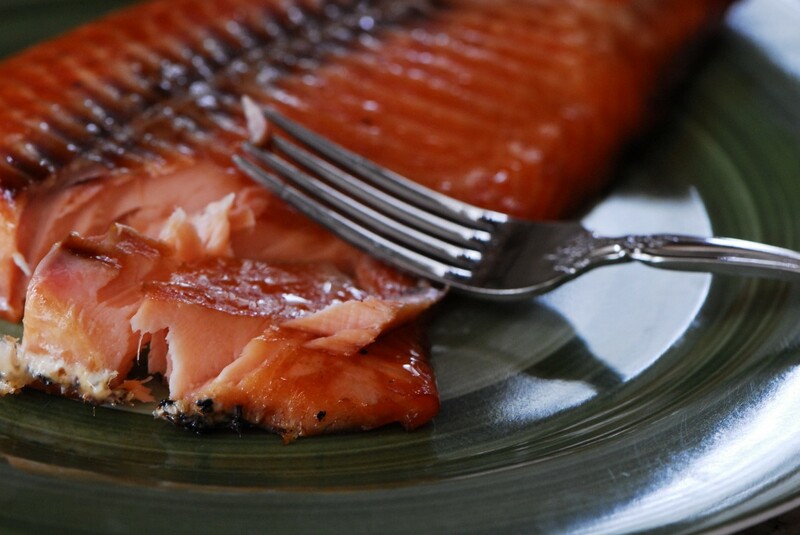 Slice your roll into bite-sized pieces with a very sharp knife when you're ready to serve. If you have made your rolls in advance, keep them in the fridge (for no more than a day - the sooner you serve them, the better) until you are ready to slice and serve. Serve your sushi with little bowls of soy sauce and some wasabi and pickled ginger on the side, if desired. 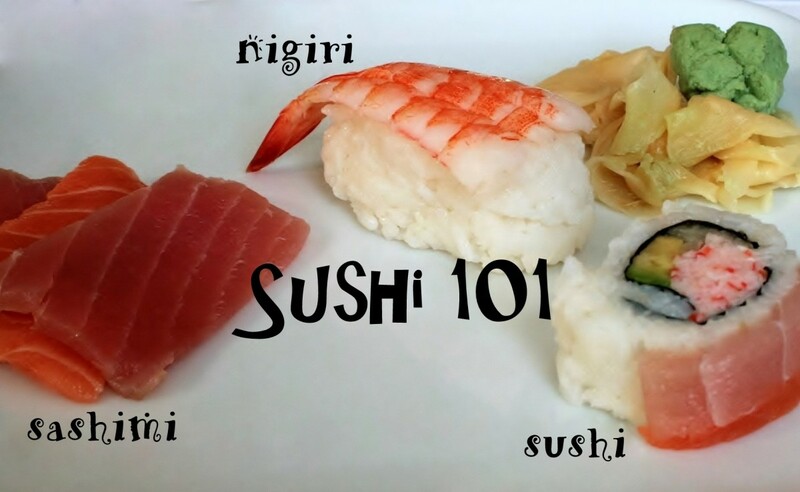 I hope you've enjoyed this beginner's guide to making sushi. 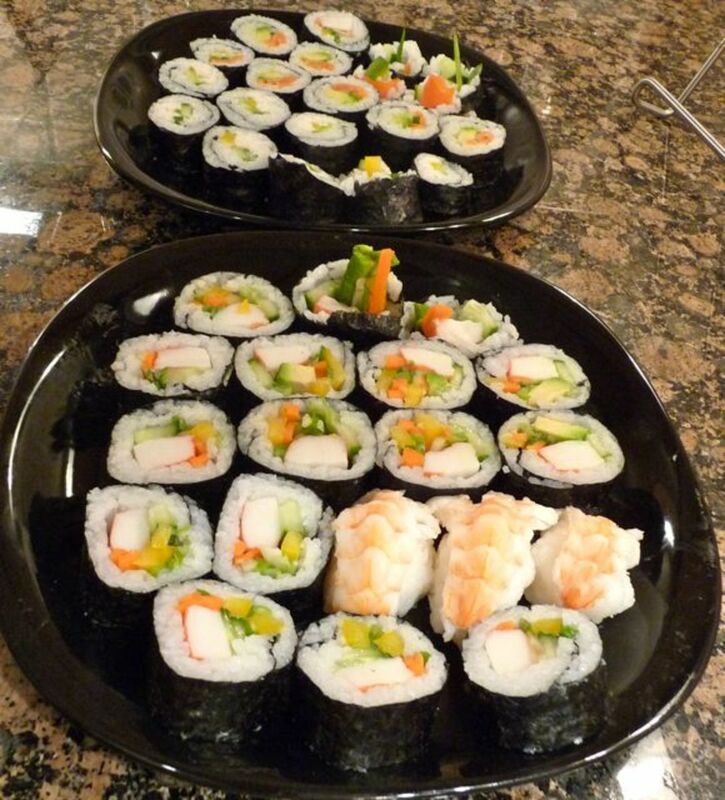 Making sushi is a wonderful group activity - I learned how to make it at a sushi-making party. Invite your friends over or get your kids involved. Just get your rice and fillings prepped before you get started and have fun with it! What's your last name? I need to cite one of your posts but I don't know your last name. Hi and thanks for making it easy for beginners! I've recently discovered that I really like sushi and have always wanted to try to make it but I never knew how. This tutorial is really great. Thanks so much. I developed an expensive sushi habit whilst living in Bermuda, and now back in the UK I have tried to make my own Sushi, which was a really satisfying process. Worst bit, washing the rice, best bit, cutting the finished rolls! Quite time consuming but well worth the effort! I have been looking for a great sushi tutorial, this is perfect! I like the sushi ball idea, it seems like an easy way to get started. It's so satisfying to make your own sushi, plus it's fun to make. I hope you like it! It's so funny that you said it was beer thirty right then, since I had just made the same comment myself! Susan, thanks for reading and commenting. 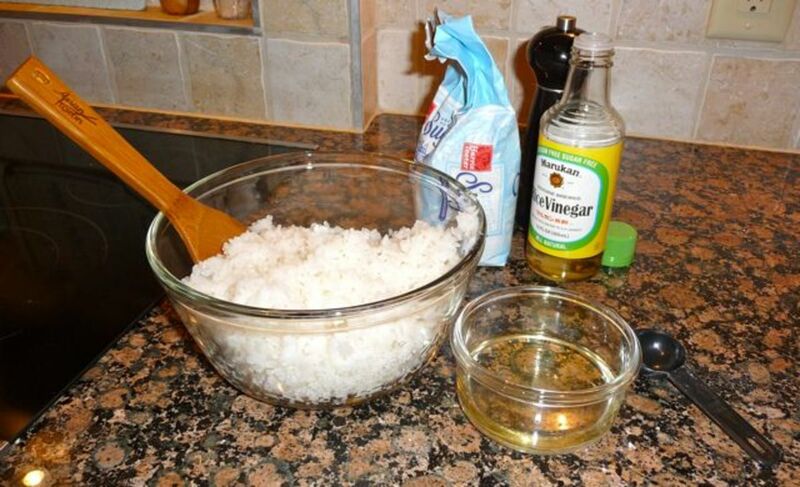 I just started using this rice recipe - I used to use less vinegar and sugar, but I like it better this way. Enjoy! I love sushi. Now I know how to make the best rice for it. Thanks for the recipe.